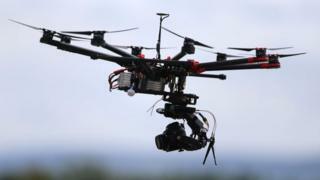 Ministers say those who use drones “for criminal purposes” can expect “the most severe sentence”. It follows three days of disruption at Gatwick airport last week, when drones were sighted near the runway. Security minister Ben Wallace said those who use drones “either recklessly or for criminal purposes” could expect “the most severe sentence”. It comes after the couple arrested and released without charge over the chaos at Gatwick said they felt “violated”. About 1,000 flights were affected during 36 hours of chaos at Gatwick airport last week. Mr Wallace said: “The huge proliferation of such devices, coupled with the challenges of deploying military counter measures into a civilian environment, means there are no easy solutions. How is the government acting? Mr Wallace did not specify what systems could be used to address the threat of drones, nor how quickly or on what scale they could be deployed. Australia’s civil aviation authorities said on Monday that drone-detecting sensors would be installed at airports from next month, saying the Gatwick chaos highlighted the need for the technology. In the UK, Labour has called for an independent inquiry into the disruption, claiming the government “failed to act” despite repeated warnings about the risks to aviation from drones. Ministers announced measures to protect aircraft in May. From next November, pilots of drones weighing more than 250g will have to register with the Civil Aviation Authority and take an online safety test. However, the government is not expected to respond to a consultation covering counter-drone technology and enforcement powers – undertaken in the summer – until early next year. The Department for Transport has dismissed claims that legislation has been delayed, and that this contributed to the Gatwick disruption, pointing out that existing laws barred flying drones over airports. What punishment could a drone operator face? In his statement, Mr Wallace said he was “confident” that Sussex Police, the force leading the investigation, “will bring to justice those responsible for what are serious criminal acts that have caused disruption and misery to thousands of passengers”. “Those people who chose to use drones either recklessly or for criminal purposes can expect the most severe sentence and jail time when caught,” he said. What about the released couple? Speaking outside their home in Crawley, West Sussex, Paul Gait and Elaine Kirk told Sky News their “privacy and identity” had been “completely exposed” after they were named in the media and their home searched. “We are deeply distressed, as are our family and friends, and we are currently receiving medical care. “The way we were initially perceived was disgusting,” they said. Mr Gait, 47, and Ms Kirk, 54, said they had been “totally overwhelmed” by the support they had received from people around the world. “We would ask that the press please respect our privacy and leave us to try and get through Christmas as best we can,” they said. Sussex Police said a damaged drone found near the perimeter of the airport near Horley on Saturday morning, close to the last reported sighting, was being forensically examined.